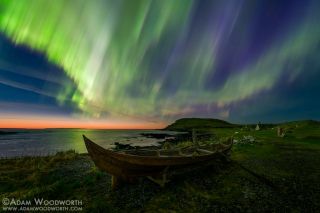 Astrophotographer Adam Woodworth took this image of an aurora from Norstead, a Viking village replica. This stunning image of an aurora was taken was taken in Norstead, a Viking village replica. The Norstead Viking Village in L'anse aux Meadows, Newfoundland is the only confirmed Viking site in North America. Astrophotographer Adam Woodworth took the image on June 22 while visiting the area. The image also shows Viking building replicas made out of sod and wood. Woodworth's image is a blend of two exposures for depth of field. He used a Nikon D810A, Nikon 14-24mm f/2.8 lens. The sky view was created with a single shot set at ISO 3200, 14mm, f/2.8, with a 1-second exposure. The foreground was then taken as a single shot at ISO 1600, 14mm, f/5.6, with a 2-minute exposure. Auroras occur when charged particles from the sun's solar wind interact with Earth's upper atmosphere (at altitudes above 50 miles, or 80 km), causing a glow. The particles are funneled to Earth's polar regions by the planet's magnetic field. The auroras over the North Pole are known as the aurora borealis, or the northern lights. The lights over the South Pole are dubbed the aurora australis, or southern lights. Follow Space.com on Twitter @Spacedotcom. We're also on Facebook & Google+. Original story at Space.com.